In synthetic research, all scientific decision-making ultimately rests on one thing: data. The ability to generate a product and acquire data about said product is paramount to making changes to synthetic methods or structural elements. As a result, the generation of product should be as fast as (or close to) the analytical method used to acquire the necessary data for the next rational step in the scientific method. This idea of producing a compound quickly, efficiently, and reliably is central to high-efficiency solid-phase peptide synthesis (HE-SPPS) methodology1. The perspective of “single peptides, fast” offers distinct advantages to the synthetic process as well as applied testing of peptides after isolation. Examining the case of a hypothetical 20mer, this peptide is made in almost 20 hours using room temperature chemistry methods. Under HE-SPPS protocols, the same sequence is complete in only two hours, a rate enhancement of 10-fold (Figure). The chemist utilizing HE-SPPS can synthesize, analyze, and plan the next step in a rational optimization strategy for this sequence (or carry product on to in vitro or in vivo testing) before the third amino acid is coupled with room temperature methods. In addition to providing speed, the microwave heating of high-efficiency methods provides simplified optimization, higher peptide purity, and even creation of sequences not accessible by conventional methods. Conventional optimization typically consists of a shotgun approach: screen resins, screen different reagent excesses, screen activators, etc. This process necessitates tens or hundreds of reactions, but optimization of purity does not necessitate this process. Better reaction kinetics through microwave heating during deprotection and coupling steps overcomes many of the variables found in these obsolete strategies, and chemists can focus on making rational synthetic decisions related to fewer variables and fewer test syntheses. 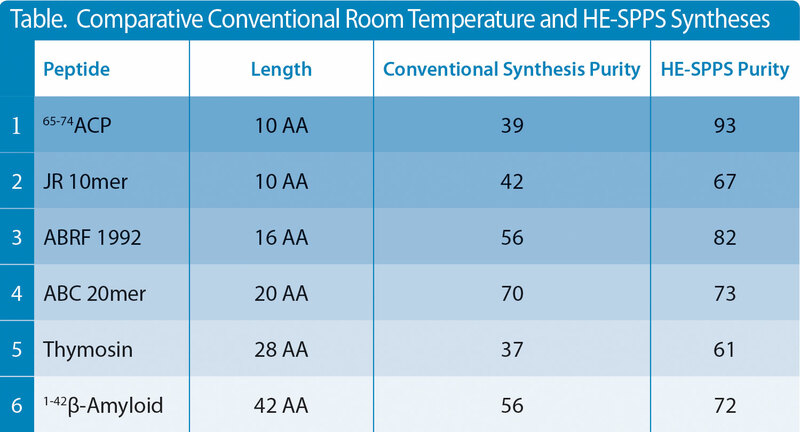 In addition to simplifying optimization, microwave HE-SPPS also provides more complete reactions, and correspondingly higher purities, due to elevated temperatures (Table). More usable peptide product means more therapeutic testing in the pursuit of a lead candidate. By minimizing synthesis time, optimization time, and repeat syntheses, HE-SPPS methodology brings a high level of practical value to synthetic chemists. Accessing “single peptides, fast” ultimately means earlier discovery of the next peptide therapeutic opportunity. Michael J. Karney (Michael.karney@cem.com) is product manager for the life sciences division of CEM. 1. Collins, J. M.; Porter, K. A.; Singh, S. K.; Vanier, G. S., Org. Lett., 2014, 6, 940.